i Click 'view all' to instantly compare this fantastic deal with offers on other top butter dishes. Sweese 3150 Butter Dish Porcelain Tub Easy Clean Wooden Lid White is currently selling at $17.99, approximately $3.32 lower than average, giving a potential saving of $24.00 right now. With a lowest price of $17.99 and an average of $21.31 it is selling on the low end of its usual range. Price volatility is 1.04% (meaning it does not change often), so the price should stay low for a while. Right now this product is a recommended 'fantastic deal'. There is a coupon available for an additional 10% off. The current deal is also the best price on this item over the last month. 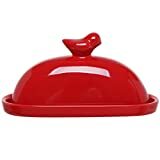 Compare the current price, savings (in dollars & percent) and Buy Ratings for the top Butter Dishes that are closely related to Sweese 3150 Butter Dish Porcelain Tub Easy Clean Wooden Lid White. Here is how Sweese 3150 Butter Dish Porcelain Tub Easy Clean Wooden Lid White compares with other leading Butter Dishes. ??? CYBER MONDAY - DEALS WEEK ??? Buy $49 or more, SAVE 5%? Buy $99 or more, SAVE 10%? Buy $199 or more, SAVE 15%? Limited time, limited offer by The Inspired Home? Enter code SWEESEBF at checkout. Add to your cart now? The Sweese butter dish is large enough to fit a wide range of shaped sticks of butter. What's more, it holds 2 sticks of butter so one can be softening while you're using the other. 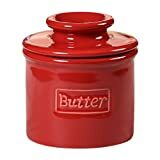 The biggest frustration when using a regular butter dish is the butter easily sticks to the top of the lid and stay there when you pick up the lid. This causes a BIG MESS. Well, the deep design of the Sweese Butter dish will help KILL the mess. It is more beautiful and safer than the ugly plastic kind of butter dish. The container is PROUDLY FDA approved and made of durable porcelain, a type of premium LEAD-FREE and NON-TOXIC ceramic, chip-resistant and more sturdy than stoneware. 1.The lid is made by beech wooden. Hand-wash only. 3.Avoid the lid soak in water for a long time,otherwise the lid will be warped. 4. Due to the different age of each tree, so the color of the trees and the density different, thus make the lid color will have differences. It is well wrapped in a gift box, makes an awesome present for gift for housewarming, wedding or anniversary. Features??? CYBER MONDAY - DEALS WEEK ??? Buy $49 or more, SAVE 5%? Buy $99 or more, SAVE 10%? Buy $199 or more, SAVE 15%? Limited time, limited offer by The Inspired Home? Enter code SWEESEBF at checkout. Add to your cart now?NO MORE MESS THANKS TO THE DEEP DESIGN - The tall and deep design helps stop the butter sticking to the top of the lid and staying there when you pick up the lid. 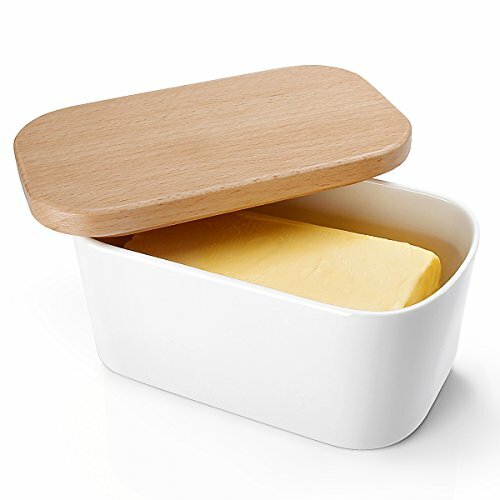 Without mess, this Sweese modern butter dish adds a touch of elegance to your kitchen.EASY TO CLEAN & DRY OUT - Beech is a relatively non-porous wood with a very strong surface. The Sweese butter dish is large enough to fit a wide range of shaped sticks of butter. If the butter accidentally get on the lid, it is possible to clean and the fat doesn't sunk in. Easy care! Hand wash with warm water and mild detergent.AS A CUTTING BOARD - The beech wooden lid of butter boat double as a small cutting board for slicing. You could use lid as a butter cutting board. Sweese beech wooden board is the best when it comes to keeping a razor sharp edge on your favorite knife when preparing butter. So convenient and useful!